You want to learn to play the drums, but you have no money to buy a drum kit? There is a way to build their own drums out of empty plastic buckets and cans of paint. The choice of the material at hand is based on the basic principles of working with sound. Before you start running around in search of empty cans and buckets, you need to learn a few basic PHONIC rules. Hollow containers such as large plastic buckets or metal cans that sound different depending on its size. According to the laws of physics, large tanks with lots of space for the vibrations of the sound will have a lower tone, while a smaller capacitance will sound higher. Based on this principle, start to create your installation. Start with a bass drum (barrel). The best choice would be pyatnadtsativekovoy industrial type bucket, like the ones they use in construction. The sound of this capacity will be the most deep and low. The best solution to create a basic drum will be inverted three-liter metal Bank. To create a special percussive effect can be to fall asleep in it a couple of nails or coins. For creating volumes use the inverted two liter plastic trays from under the ice. To retrieve sounds of different heights to experiment with the bumps on the edge and the center. To create plates, use the glasses in different sizes. Depending on the size and material, the glasses will sound different. If you are afraid to break the glasses, then try to use the metal lids from pots. 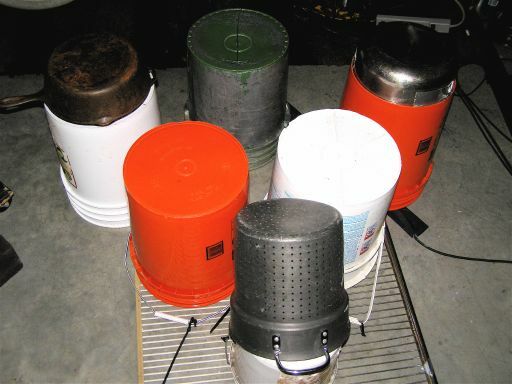 Once you have collected all of your bucket, place them on a flat surface with the holes down so the sound does not spread out, but vibrate within the drums. Put a chair, sit on it so that the bass drum is between your knees. The rest of the drums put on the table just above your knees. It remains to find a pair of drumsticks and start playing. Before you start to practice playing the new drum set, make sure that the place has sufficient soundproofing. The best solution is a garage or basement of your home.